Over 160 attendees arrived at the Bank of America Merrill Lynch (BAML) building in the City on a rare sunny Saturday (!) 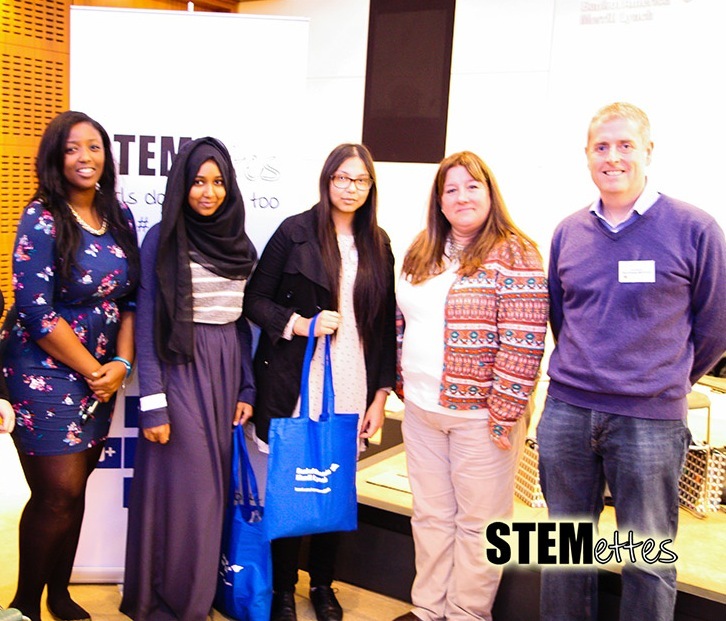 in October for the Stemettes ‘Ada Lovelace Day‘ 2013 panel event; as befitting the panel was made up of 7 women and one mystery male panellist working in STEM. Our Lady’s Catholic High School in Preston got a special mention as they had to take a two-hour train ride to make the event. We had a large group of Luton Sixth formers and pupils from the Mulberry School for Girls in Tower Hamlets in total there were just over 90 girls present. Lee spoke of his work heading up the Diversity and Inclusion Council, which reports to the Director of Merrill Lynch Europe underscoring the importance of diversity to the company. He also talked of his excitement about working with Stemettes as BAML share the same values and passion for doing things in a different way in order to get different outcomes. Lee then spoke of the impact of stereotypes using the example of the adjectives girls attending Mulberry School used to describe people working in STEM: unsociable, messy, lives alone, does not like cats were just some them! He told the audience that this was a false conception as in reality code is written in teams and working in software development is team sport so much so that BAML look for team not just technical skills when recruiting. In complete contrast, the girls who attended the coding club at the school were more likely to describe someone working in STEM as a woman who is social and likes to learn. This was a concrete example of how quickly stereotypes die when girls are presented with the opportunity to get involved in anything STEM related. Panel Q&A – what are you in STEM? The Panel were each given a 2 minute countdown in which to tell us a little about who they were, what they did at school and university and what they now do in STEM as well as questions on their favourite actresses and beauty products. As the moderator, Anne Marie, pointed out this was not as unserious as it sounded given that a lot of chemical testing goes into ensuring that the beauty products we all use are safe and that is another potential role for our future Stemettes! Anne-Marie explained that Ada Lovelace was the world’s first programmer 200 years ago, and also told the story of Hedy Lamarr – a well-known actress and WiFi inventor from 100 years ago. Our modern day Stemettes on the panel were given the opportunity to choose a Victorian invention that they wish they had come up with. They had to choose between the sewing machine, radio, Morse code, cinematography, the electric light bulb and jelly babies! Chris O’Dell from 7Digital – a digital music platform – told us that she liked solving problems and was interested in programming from a young age as her dad was a coder and so she studied Computer Science at university. Francesca who works for the National Institute for Health Research and has a PHD in inorganic chemistry chose to study science over history as it is something that you can’t learn on your own as you need labs and scientific equipment. She also wanted to prove a teacher who said she wasn’t very good wrong. Lydia Monnington, a Data Analyst at online supermarket Ocado studied Maths at university and explained her day job involved looking at statistics of how people used the company website to do their shopping and what supplies were needed at the warehouse. Sharon Kindleysides an engineer brought out a spanner and asked who in the audience thought that that was what all engineers used on a daily basis. She then explained that her work as an engineer was not to use the spanner to hit people over the head with. Instead her work has taken her to places as diverse as nuclear power stations and shipyards. She also in her own words told us of how she had ‘messed up’ her A Levels and told the girls in audience to never give up in the face of setbacks if they are truly passionate about something. Giulia Thompson a physicist at Elekta talked of her work using physics to build cancer-treating machines and of her experience of studying physics in Italy. Dawn Hewitson told us of how she first got involved in STEM by working in a computer shop upgrading computers and she now a higher education STEM teacher inspiring the next generaion. Jennifer Scott a real life Mathematician at the Rutherford lab studied Maths at university as she didn’t to write essays. She wanted to use maths to solve real problems and in her work uses some of the fast computer systems in the world! The Mystery panelist Piers Thompson – the typical ‘White middle aged male who does not like cats’ – works for BAML and explained that banks are not just banks but also large technology companies. He was inspired by his grandfather who was an aeronautical engineer and got his first job working on software for military aircraft. He said that a career in STEM is great as you get to work with teams of creative and intelligent people. The sheer breadth of experience on the panel impressed upon future Stemettes of the diversity of roles and work in STEM. Networking & Cupcakes… and fruit! The girls were all then let loose to play networking games in the breakout room with the aim of meeting and talking to as many different women working in STEM as possible. This was also a chance for all the Stemettes to enjoy the refreshments on offer! The girls who scored highest in the networking activities were presented with prizes and all received goodie bags! Two of the winners at the end of our event. Check out the full gallery on our Flickr and Facebook pages. Think girls can do science too? Follow @Stemettes on Twitter and find out more about upcoming events at https://www.stemettes.org – we’ll be at Christ Church college in Oxford on 26th & 27th October with BIPB, running a ‘Big Data’ hack for girls.